When I was at Jadestone, one of the objectives that the CEO explicitly gave me was to come up with a great way to share code between our products. I spent a fair amount of time thinking about and working on how to do that, but I left the company before most of the ideas came to be fully used throughout the company. Just over a year later, I joined Shopzilla, and found that to a very large extent the same ideas that I had introduced as concepts at Jadestone were being used or recommended in practice there. So a lot of the articles I’ve written about code sharing describe ideas and practices from Jadestone and Shopzilla, although focusing specifically on things I personally find important. This one will cover some areas were I think we still have a bit of work to do to really nail things at Shopzilla, although we probably have the beginnings of many of the practices down. You can’t include all your code into every top-level product you build. This means you’ll need to break your ecosystem down into some sort of sub-structures and pick and choose the parts you want to use in each product. I think it makes sense to have three kinds of overlapping structures: libraries, layers and services. Libraries are the atoms of sharing and since you use Maven, one library corresponds to a single artifact. 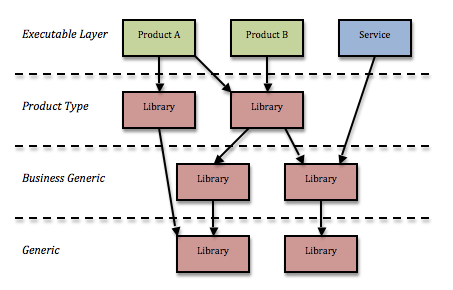 A library will build on functionality provided by other libraries, and to manage this, they should be organised into layers, where libraries in one layer are more general than libraries in layers above. A lot of the time, you’ll want to have a coarser structure than libraries, for both code management, architectural and operational reasons, and that’s when you create a service that provides some sort of function that will be used in the top-level products. Over-large and incoherent libraries. Typical indications of this are a high rate of change and associated high frequency of conflicting changes, forced inclusion of code that you don’t really need into certain builds because stuff you need is packaged with unrelated and irrelevant other code, and difficulties figuring out what dependencies you should have and where to add code for some new feature. Shared libraries that contain code that isn’t really a good candidate for sharing. Trying to include that code in different products typically leads to a snarled code in the library with lots of specific conditions or APIs that haven’t made a decision on what their clients actually should use them for. Sometimes, the library will contain some code that is perfect for sharing, and some that definitely isn’t. A poor dependency structure: a library that is perfect for sharing might have a dependency on one that you would prefer to leave as product-specific, or there might be circular dependencies between libraries. Once a library structure is in place and used by multiple teams, it is hard to change because a) it involves making many backwards-incompatible changes, b) it is work that is boring and difficult for developers, c) it gives no short-term value for business owners, and d) it requires cross-team schedule coordination. However, it’s one of those things where the longer you leave it, the higher the accumulated costs in terms of confusion and lack of synergies, so if you’re reasonably sure that the code in question will live for a long time, it’s is likely to eventually be a worthwhile investment to make. It is possible to do at least some parts of a library restructuring incrementally, although there are in my experiences some cases where you’ll bring a few people to a total standstill for a month or so while cleaning up some particular mess. That sort of situation is of course particularly hard to get resolved. It requires discipline, coordination, and above all, a clear understanding of the reasons for making the change – those reasons cannot be as simple as ‘the code needs to be clean’, there should be a cost-benefit analysis of some kind if you want to be really professional about it. If you invest a man-month in cleaning up your library structure, how long will it take before you’ve recouped that man-month? Libraries are coherent and of the right size. There are some opposing forces that affect what is “the right library size”: smaller libraries are awkward to work with from a source management, information management and documentation perspective since the smaller the libraries are, the more of them you need. This means you’ll have more or more complicated IDE projects and build files, and you’ll have a larger set of things to search in order to find out where a particular feature is implemented. On the other hand, larger libraries suffer from a lack of purpose and coherence, which makes conflicts between teams sharing them more likely, increases their rate of change, and makes it harder to describe what they exist to do. All these things make them less suitable for sharing. I think you want to have libraries that are as fine-grained as you can make them, without making it too hard to get an overview over which libraries are available, what they are used for and where to find the code you want to make a change to. There’s a clear definition of what type of information and logic goes where in the layered structure. At the bottom, you’ll find super-generic things like logging and monitoring code. Slightly higher up, you’ll typically have things that are very central to the business: normally anything that relates to money or customers, where you’ll want to ensure that all products work the same way. Further upwards, you can find things that are shared within a given product category, and if you have higher level libraries, they are quite likely to be product-specific, so maybe not candidates for sharing at all. In addition to the horizontal structure defined by the layers, there is a coarse-grained vertical structure provided by services. Services group together related functions and are usually primarily introduced for operational reasons – for instance, the need to scale a certain set of features independently of some other set. But they also add to architectural clarity in that they provide a simpler view on their function set, allowing products to share implementations of certain features without being linked using the same code. Services also simplify code sharing in the way that they provide isolation: you can have separate teams develop services and clients in parallel as long as you have a sufficiently well-defined service API. Structuring your code in a way that is conducive to sharing is a good thing, but it is also hard. I particularly struggle with the fact that it is very hard to be agile about it: you can’t easily “inspect and adapt”, because of the difficulty of changing a library structure once it is in place. The best opportunity to put a good structure in place is when you start sharing some code between two products, but at that time it is very hard to foresee future developments (how is product number three going to be similar to or different from products 1 and 2?). Defining a coarse layered structure based on expected ‘genericness’ and making libraries small enough to be coherent is probably the best way to get the structure approximately right. This entry was posted on June 3, 2010, 14:37 and is filed under Code Management. You can follow any responses to this entry through RSS 2.0. You can leave a response, or trackback from your own site.